"This research suggests the regulatory system for pesticides may have let us down once again." It’s a well-known fact that global bee populations are on the decline. Scientists have been struggling to better understand the alarming trend for years, and a new study appears to have shed some light on a key contributing factor. The new study, published in the journal Proceedings of the Royal Society B, has shown that fungicides are a leading factor linked to bee population declines. 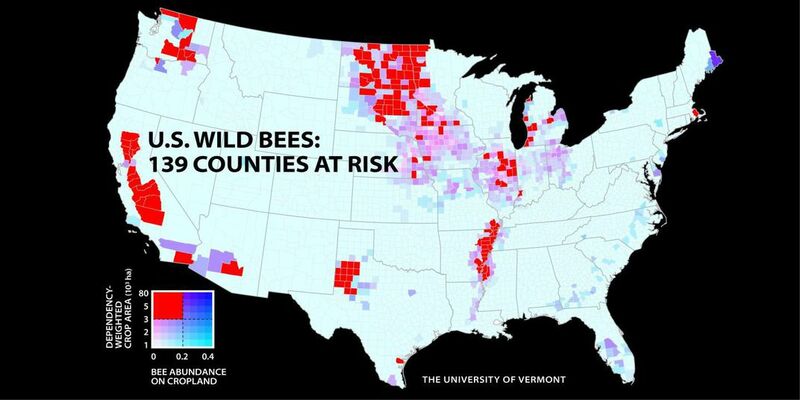 In a presentation at the American Association for the Advancement of Science (AAAS) annual meeting, it was revealed that from 2008 to 2013, populations declined about 23 percent across the contiguous U.S., and in 139 counties throughout the U.S., wild bee populations are considered to be in serious danger. Researchers are not positive about why they pose such a distinct threat to bees, but the present conclusion is that they make bees more susceptible to the deadly nosema parasite and/or increase the toxicity of other pesticides. What scientists do know is that whatever the mechanism is that makes fungicides so deadly to bees, it needs to be addressed for the sake of these populations.